On 10 July 2014, just days after the escalation of violence in the Gaza Strip, the World Health Organization raised concern about the ability of the Ministry of Health of the occupied Palestinian territory to cope with the new emergency and its increased burden on the health system, given the high levels of shortages of medicines, medical disposables and hospital fuel supplies, and rising health care debt. The World Health Organization (WHO) and the Palestinian Ministry of Health, and with UNRWA coordination, called on local and international donors to support the Ministry by providing US$ 40 million for medicines and medical supplies, and US$ 20 million for referral costs, to protect the health and welfare of Palestinians during the emergency. The violence has been unprecedented in terms of the human toll. At the time of the appeal, there had been 80 deaths and 570 injuries, and one hospital and three clinics had been damaged. Today, following a negotiated ceasefire ending 51 days of violence, the casualty toll stands at 2130 deaths and more than 11 000 injuries, most of whom have been treated in Ministry of Health hospitals and clinics. At the same time, 17 of Gaza’s 32 hospitals and 45 of 97 primary health clinics have been damaged, and 4 hospitals and 5 clinics are still closed after severe damage. The response from the donor community through providing humanitarian aid and assistance to the Palestinian health sector has been crucial for maintaining services at a high level in Gaza. According to the Ministry of Health, which together with WHO, is coordinating with donors to ensure that aid is targeted to needs and that delivery is facilitated into Gaza, a total of US$ 12.6 million from 39 donor agencies, governments, humanitarian organizations and other donors has been delivered to the health sector in Gaza. 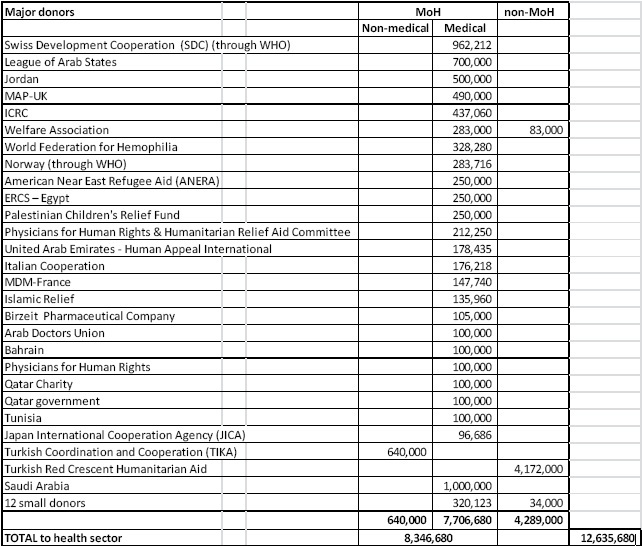 Two thirds of these donations (US$ 8.35 million) were targeted to Ministry of Health facilities. Ninety-two per cent of the donations to the Ministry of Health were medicines and medical disposables, especially for trauma treatment. The remaining donations were for medical equipment, fuel supplies to hospitals, and meals for patients and staff in hospitals. In addition, US$ 5.3 million in donations from 28 donors are in process or in the pipeline for delivery to Gaza. Almost all is for drugs and medical supplies and destined for the Ministry of Health facilities. In total, the WHO appeal for US$ 40 million for medicines and medical supplies for the Ministry of Health in Gaza has achieved a response rate of 45%, considering both medical supplies delivered and those in the pipeline, as reported by the Ministry of Health up to 3 September. In addition, the UN Gaza appeal which was launched during the emergency and was updated following the ceasefire, requests US$ 23.5 million for health sector intervention to be implemented by UN agencies, including US$ 8.1 million for WHO, and by nongovernmental organizations to support health services in Gaza in the recovery period. Israeli violations of international law and international humanitarian law in the oPt continued during the reporting period (28 August – 03 September 2014). In the Gaza Strip, although 9 days have passed following the Egyptian-brokered truce agreement between the Palestinian resistance groups and Israel, the catastrophic consequences of the 51-day Israeli offensive on the Gaza Strip have been present. During the reporting period, a number of wounded persons died of wounds they sustained during the offensive. During the reporting period, a Palestinian baby died because of tear gas inhalation in occupied Jerusalem, as Israeli forces fired tear gas canisters to disperse the Palestinian protesters in al-Tour Mountain, east of the city. Moreover, 2 civilians, including a woman and a child, died of wounds they sustained during the latest Israeli offensive on the Gaza Strip, while hundreds of wounded Palestinians have been receiving medical treatment in hospitals in the West Bank and Gaza Strip and other hospitals abroad for the seriousness of their wounds. In the meanwhile, Israeli forces violated the truce several times by opening fire at Palestinian fishing boats sailing within the allowed fishing area and arresting a number of fishermen. A Palestinian baby died in Jerusalem because of tear gas inhalation when Israeli forces were dispersing Palestinian protesters in al-Tour Mountain, east of the city, while 4 other civilians, including a woman and a child, died of wounds they sustained during the latest Israeli offensive on the Gaza Strip. During the reporting period, 10 Palestinian civilians were wounded in the West Bank, including 3 children, and old woman and a journalist. Wounds of some of them were described as serious. In the West Bank, a baby, Hanadi Abu Sbeitan, from al-Tour neighbourhood in occupied east Jerusalem died on Thursday, 28 August 2014, because of tear gas inhalation, when Israeli forces fired tear gas canisters at her family's house on 26 August 2014. On 29 August 2014, a 17-year-old male sustained 2 bullet wounds to the left leg when Israeli forces opened fire at a number of boys in Daher al-Baragheesh area, east of Beit Ommar, north of Hebron. 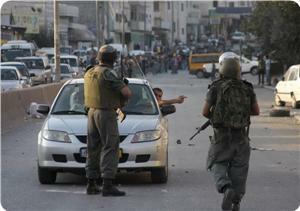 The boys threw stones at Israeli soldiers, who opened fire in response. On 01 September 2014, a 40-year-old man sustained a bullet wound to the belly, and a 78-year-old elderly woman suffered tear gas inhalation, when Israeli forces moved into al-Far’ah refugee camp. The woman was taken to Tubas Turkish Hospital for the seriousness of her health condition. On 31 August 2014, Israeli forces fired rubber-coated metal bullets at Mohammed Abdul Majid Sonoqrot (16), east of the Old City in East Jerusalem. Sonoqrot sustained a bullet wound to the head and his wound was serious. His father said that an Israeli soldier targeted his son and fired at him from a close range during the Israeli incursion into the said area. On 02 September 2014, Israeli forces stationed at “Eyal” checkpoint, north of Qalqilya, opened fire at a jeep with an Israeli registration plate driving through the checkpoint. As a result, 2 civilians, who had no permits to enter Israel, were wounded. The wound of one of them was serious. The 2 persons were arrested and taken to Israeli hospitals for medical treatment. On 03 September 2014, a Palestinian adult and a child were wounded when Israeli forces moved into Nablus, as a group of youngsters gathered and threw stones at Israeli soldiers. The Israeli forces surrounded a 3-storey house and shelled a wall in the building, while opened fire at the second floor. Israeli forces claimed there was a wanted person hiding in the building, but it was proved untrue. Israeli forces used excessive force against peaceful protests organised by Palestinian civilians, international and Israeli human rights defenders in protest at the construction of the annexation wall and settlement activities in the West Bank. As a result, a reporter of Palestine TV was hit by a tear gas canister to the right side while covering Bil’in weekly protest, west of Ramallah. Many other civilians suffered tear gas inhalation and 2 international solidarity activists were arrested in the same protest. In the Gaza Strip, medical sources in Palestine Hospital in Egypt declared that Wedad Abu Zaid died on 29 August 2014 because of wounds she sustained during the Israeli offensive on the Gaza Strip on 29 July 2014. On 01 September 2014, medical sources pronounced Basem ‘Ajour (60) dead of wounds he sustained during the Israeli offensive on 25 August 2014. On the same day, medical sources pronounced Zeyad al-Rifi (13) dead of wounds he sustained on 21 August 2014 in an attack in al-Nafaq area. On 03 September 2013, medical sources in Egypt pronounced Nasser Abu Marahil (40) dead of wounds he sustained on 25 July 2014 in al-Nusairat area. In the context of chasing Palestinian fishermen in the sea, on 02 September 2014, Israeli gunboats stationed off Rafah shore in the southern Gaza Strip opened fire at Palestinian fishing boats, while gunboats stationed off al-Sudaniya shore, northwest of Beit Lahia in the northern Gaza Strip opened fire at Palestinian fishing boats for the second time. Neither arrests nor material damage were reported. On 01 September 2014, Israeli gunboats stationed off al-Waha resort opened fire at Palestinian fishing boats. They arrested 2 fishermen and confiscated their fishing boat and net. There has been no information so far about the destination to which they were taken so far. During the reporting period, Israeli forces conducted at least 77 military incursions into Palestinian communities in the West Bank. During these incursions, Israeli forces arrested at least 60 Palestinians, including 5 children. Fourteen of these civilians were arrested in Jerusalem. On 03 September 2014, Israeli forces moved into Nablus. They surrounded a 3-storey building that is rented by a charitable society and a sport club. They shelled a wall in the building and opened fire at the second floor under the pretext there was a wanted person hiding inside, but there was no body in. A few hours later, Israeli forces moved into the city and raided al-Zahra’ building in al-Ma’ajeen neighbourhood. They raided an apartment belonging to Ahmed Ali Ahmed Ali Ahmed (75), Member of the Palestinian Legislative Council for the Change and Reform Bloc. They bombed the apartment’s door and those of other apartments under the pretext of looking for Ahmed. As part of using military checkpoints and border crossings as traps to arrest Palestinian civilians under the pretext they are wanted, Israeli forces arrested 9 Palestinian civilians, including 3 children and a woman, at military checkpoints in the West Bank. On 28 August 2014, Israeli forces bulldozed 5 residential barracks and 3 animal barracks belonging to Saidi and al-Jahalin families. They also destroyed a cow shed belonging to Muahmmed Abu al-Hawa in Zaim village, east of Jerusalem after Civil Administration staffs and Israeli forces raided the aforementioned village. The affected families confirmed that the lands in question belong to them and that they have lived in them since the 1950s. On 03 September 2014, Israeli forces accompanied by bulldozers and the Israeli municipality's staff moved into Beit Hanina neighborhood, north of Jerusalem. They surrounded residential buildings belonging to Izz Abu Nijma, and started bulldozing under the pretext of not having a construction license. The Israeli construction and planning committee approved the construction of a religious school in al-Sheikh Jarah neighborhood in Jerusalem. The committee had approved the plan last February. According to the construction plan (68858), a building of 12 floors will be built on an area of 1.9 dunums out of 4 dunums. The building will include a religious school, residential rooms, and gymnasiums. 1The project is located behind Nasif gas station and al-Hayat medical center. The land was confiscated in the 1980s allegedly because it was absentees’ property. On 31 August 2014, Israeli forces backed by several military vehicles and a vehicle for the construction and organization department in the Israeli Civil Administration, raided the western area of Surif village, west of Hebron. The Civil Administration officers distributed notices claiming the confiscation of 3,799 dunums of Surif village and the villages of Bethlehem (al-Jaba’a, Nahlin, and Wadi Fokin) after dividing them to 10 squares, according to the notices which were signed by the official of the government and the absentees’ properties in Judea and Samaria. On the same day, Israeli forces backed by 3 military vehicles moved into al-Rahwa area, west of al-Zahrya village, west of Hebron. Israeli forces deployed in the area while the bulldozer destroyed a number of houses under the pretext of having no construction permit to build in the areas classified as “C” according to the 1993 Oslo Accord. On 02 September 2014, Israeli forces, backed by several military vehicles, a vehicle of the construction and organization department in the Israeli Civil Administration, 2 bulldozers, a GCB bulldozer and a digger, moved into Haram al-Rama in the eastern area in Hebron. They surrounded al-Rahma factory for dairies, which is part of al-Rayyan cow farm which is one of the branches of the Islamic Philanthropist Society in Hebron. Israeli soldiers deployed in the area while the bulldozers started destroying the 350m2 factory and the 7-dunum farm under the pretext of having no construction permit to build in the areas classified as “C” according to the 1993 Oslo Accord. On the same day, Israeli forces bulldozed a 70-square-meter, tin-made barrack which was used as a carwash. Later, they bulldozed another 40-square-meter tin barrack which was used as a pottery factory. On 03 September 2014, Israeli forces demolished 2 residential tents in al-Rakheem valley, south of Yatta, south of Hebron. On 28 August 2014, Israeli settlers from ”Beit Ain” settlement which is established on confiscated lands west of Beit Ummar village, north of Hebron, smashed the branches of 30 olive and almond trees belonging to Abdel Hamid Bright (78) in Abu Rish area. On 28 August 2014, 2 Israeli extremists attacked Ziad Musa al-Qawasmi (48), a Palestinian taxi driver when he was driving in one of the streets in Jerusalem. On 31 August 2014, 3 settlers tried to kidnap Ahlam Awad Muhei Awadallah (26) when she was returning to her house in Shufat. Her husband, Muahmmed Awadallah told PCHR that 3 extremist settlers were driving a Mitsubishi car. The stopped the car near her when she was walking towards her house in al-Sahel neighborhood in Shufat. They verbally attacked her and tried to grab her and pull her into the car. They failed to do as residents of the area intervened. During the reporting period, Israeli soldiers used excessive force against peaceful demonstrations organized by Palestinian civilians, international and Israeli human rights defenders in protest at the construction of the annexation wall and settlement activities in the West Bank. As a result, Ali Dar Ali (30), a reporter of Palestine TV, was hit by a gas canister to the right side while covering Bil’in weekly protest, west of Ramallah. Besides, several demonstrators suffered tear gas inhalation and others sustained bruises as they were beaten up by Israeli soldiers. Israeli forces arrested 2 international solidarity activists during the said protest. In the same context, an 18-year-old male was hit by a gas canister to the left side of his chest during a peaceful protest that was organized on Friday, 29 August 2014, at the western entrance of Selwad village, northeast of Ramallah, condemning the Israeli attacks in the oPt. · Following the Friday Prayer on 29 August 2014, dozens of Palestinian civilians and international and Israeli human rights defenders organized a peaceful demonstration in Bil’in, west of Ramallah, in protest at the construction of the annexation wall and settlement activities. The demonstrators took the streets raising the Palestinian flags and headed to the liberated territories near the annexation wall. Early in the morning, Israeli forces closed all entrances to the city to prevent Palestinian civilians and international and Israeli human rights defenders from participating in the protests. Protestors marched by the annexation wall and tried to cross the fence. Israeli soldiers stationed behind the wall, in the western area, and a large number of soldiers deployed along it, fired live bullets, tear gas canisters, rubber-coated steel bullets, sound bombs and waste water at them and chased them into the olive fields. As a result, Ali Dar Ali, a reporter of Palestine TV, was hit by a tear gas canister to the right side. In addition, several demonstrators suffered tear gas inhalation and others sustained bruises as they were beaten up by Israeli soldiers. Moreover, Israeli forces arrested 2 international solidarity activists, whom were not identified. They were taken to an unknown destination. · At the same time, dozens of Palestinian civilians organized a peaceful demonstration in Nil'in village, west of Ramallah, in protest at the construction of the annexation wall and settlement activities and in solidarity with the Palestinian prisoners on hunger strike. The demonstrators made their way towards the annexation wall. Israeli forces closed the wall gate with barbwire and, when the demonstrators attempted to access the lands behind the barbwire, they were stopped by Israeli soldier. The demonstrators threw stones at the Israeli soldier who responded with live ammunition, rubber-coated metal bullet, sound bombs, tear gas canisters, and waste water at them and chased them into the village. · Around the same time, dozens of Palestinian civilians and Israeli and international human rights defenders organised a peaceful demonstration in Nabi Saleh village, southwest of Ramallah, in protest at the construction of the annexation wall and settlement activities. The demonstrators made their way in the streets raising the Palestinian flags and chanting slogans against the occupation and in support of the Palestinian unity resistance, and then they headed to the lands that the settlers are trying to rob by force near “Halmish” settlement. Israeli forces had closed all the entrances of the village since the morning to prevent Palestinian and international activists and journalists from participating in the demonstration. When they arrived at the aforementioned land, demonstrators were met by live bullets, tear gas canisters, rubber-coated steel bullets, sound bombs and skunk water and were chased into the village. · At approximately 13:20 on the same day, dozens of Palestinian civilians and international activists organized a peaceful demonstration in the center of Kufor Qaddoum village, northeast of Qalqilya, in protest at the closure of the eastern entrance of the village with a metal gate since the beginning of the second Intifada. Protestors threw stones at the Israeli soldiers who fired live bullets, tear gas canisters, rubber-coated steel bullets, and sound bombs in response. · On Friday afternoon, 29 August 2014, dozens of Palestinian young men gathered at the western entrance of Selwad village, northeast of Ramallah on the road between Selwad village and Yabrod village near Street (60) to throw stones at the aforementioned street. Israeli soldiers fired live ammunition, rubber-coated metal bullets, sound bombs and tear gas canisters at the civilians, and chased them into the village. As a result, an 18-year-old Palestinian was hit by a gas canister to the left side of his chest. He was taken to Palestine Medical Compound in Ramallah to receive the necessary medical treatment. Moreover, a number of civilians suffered tear gas inhalation and others sustained bruises as they were beaten up by Israeli soldiers. · Hebron: Israeli forces have continued to impose severe restrictions on the movement of Palestinian civilians. At approximately 08:00 on Thursday, 28 August 2014, Israeli forces established a checkpoint at the northern entrance of Hebron. At approximately 15:00, a similar checkpoint was established at the entrance of al-Aroub refugee camp, north of the city. Both checkpoints were removed, and no arrests were reported. At approximately 15:00 on Saturday, 30 August 2014, Israeli forces established a checkpoint at the entrance of Beit Kahel village, north of Hebron. The checkpoint was removed, and no arrests were reported. At approximately 07:00 on Monday, 01 September 2014, Israeli forces established a checkpoint at the entrance of Bani Na’im village, south of Hebron. At approximately 08:00, Israeli forces established a checkpoint at the entrance of al-Raiheya village, south of the city and another checkpoint at the entrance of Nouba village, west of the city, at approximately 15:00. All checkpoints were removed, and no arrests were reported. At approximately 07:00 on Tuesday, 02 September 2014, Israeli forces established a checkpoint at the northern entrance of Hebron. At approximately 07:30, a similar checkpoint was established the road connecting Doura with its western villages, southwest of the city. Both checkpoints were removed, and no arrests were reported. At approximately 06:30 on Wednesday, 03 September 2014, Israeli forces established a checkpoint at the entrance of Kharsa village, south of Doura, southwest of Hebron. The checkpoint was removed later, and no arrests were reported. · Ramallah: Israeli forces have continued to impose severe restrictions on the movement of Palestinian civilians. At approximately 21:30 on Thursday, 28 August 2014, Israeli forces re-established their presence at the northern entrance of Birzait village, north of Ramallah. The checkpoint was removed later, and no arrests were reported. At approximately 09:30 on Friday, 29 August 2014, another checkpoint was established at the entrance of al-Nabi Saleh village, northwest of Ramallah. At approximately 10:00, Israeli forces established a checkpoint at the entrance of Ni’lin village, west of the city. 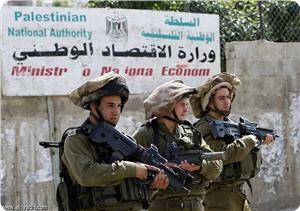 At approximately 20:00, Israeli forces established a checkpoint at the entrance of Senjel village, north of Ramallah. Around the same time, Israeli forces established a checkpoint under a bridge in Yabroud village, northeast of the city. The checkpoints were removed, and no arrests were reported. At approximately 18:30 on Saturday, 30 August 2014, Israeli forces established a checkpoint at the entrance of Beit ‘Our al-Foqa village, southwest of Ramallah. Around the same time, they established a similar checkpoint at the entrance of Deir Abu Mesh’el village, northwest of the city. They withdrew later and no arrests were reported. At approximately 09:30 on Sunday, 31 August 2014, Israeli forces established 2 checkpoints at the entrance of Aboud village, northwest of Ramallah, and the entrance of Deir Abu Mesh’el village. At approximately 20:30, they established a similar checkpoint at the entrance of Termis’ya village, north of the city. All the checkpoints were removed, and no arrests were reported. At approximately 11:00 on Monday, 01 September 2014, Israeli forces established 2 checkpoints at the entrance of Ni’lin village, west of Ramallah, and under the bridge of Kherbatha al-Mesbah village, southwest of the city. At approximately 17:00, they established a checkpoint near the entrance of Beit ‘Our al-Fouqa village, southwest of Ramallah. The checkpoints were removed, and no arrests were reported. At approximately 20:30 on Tuesday, 02 September 2014, Israeli forces established 2 checkpoints at the entrance of Beit ‘Our al-Fouqa village, southwest of Ramallah, and under the bridge of ‘Ein Yabroud village, northeast of the city. At approximately 22:00, Israeli forces established a checkpoint near the entrance of Beit Luqia village, west of Ramallah. The checkpoints were removed, and no arrests were reported. · Jericho: Israeli forces have continued to impose severe restrictions on the movement of Palestinian civilians. At approximately 09:30 on Friday, 29 August 2014, Israeli forces established a checkpoint at the entrance of Fasayel village, north of Jericho. At approximately 20:00, they established a similar checkpoint at the entrance of al-Zbaidat village, north of the city. They withdrew later and no arrests were reported. At approximately 20:30 on Saturday, 30 September 2014, Israeli forces established a checkpoint near the southern entrance of Jericho. The checkpoint was removed later, and no arrests were reported. At approximately 20:00 on Sunday, 31 August 2014, Israeli forces established a checkpoint at the entrance of al-Nowai’ma village, north of Jericho. The checkpoint was removed later, and no arrests were reported. · Tulkarm: Israeli forces have continued to impose severe restrictions on the movement of Palestinian civilians. At approximately 09:00 on Thursday, 28 August 2014, Israeli forces stationed at Enab checkpoint on Tulkarm-Nablus road, east of Tulkarm, imposed more restrictions, but no arrests were reported. At approximately 19:30, Israeli forces established a checkpoint on Tulkarm-Nablus road, east of Tulkarm. The checkpoint was removed, and no arrests were reported. At approximately22:30, Israeli forces stationed at Enab checkpoint redeployed around the checkpoint and imposed more restrictions on the Palestinian civilians. At approximately 19:30 on Sunday, 31 August 2014, Israeli forces stationed Enab checkpoint on Tulkarm-Nablus road, east of Tulkarm, imposed more restrictions, but no arrests were reported. At approximately 07:00 on Monday, 01 September 2014, Israeli forces established a checkpoint on Tulkarm-Nablus road near the intersection leading to Bazarya village, east of Tulkarm. The checkpoint was removed, and no arrests were reported. At approximately 13:30 on Tuesday, 02 September 2014, Israeli forces established a checkpoint on the road connecting Tulkarm with its northern villages. The checkpoint was removed later, and no arrests were reported. · Jenin: Israeli forces have continued to impose severe restrictions on the movement of Palestinian civilians. At approximately 09:00 on Thursday, 28 August 2014, Israeli forces established a checkpoint at the entrance of Kfeirat village, southwest of Jenin. A similar checkpoint was established at the entrance of Ya’bad village, southwest of the city. At approximately 09:30, Israeli forces established a checkpoint at the entrance of al-Yamoun village, northwest of Jenin. The checkpoints were removed later and no arrests were reported. At approximately 11:00 on Monday, 01 September 2014, Israeli forces established a checkpoint at the entrance of Ya’bad village, southwest of Jenin. The checkpoint was removed, and no arrests were reported. · Salfit: Israeli forces have continued to impose severe restrictions on the movement of Palestinian civilians. At approximately 09:30 on Thursday, 28 August 2014, Israeli forces established a checkpoint between Kufol Hares and Hares villages, north of Salfit. The checkpoint was removed and no arrests were reported. At approximately 20:35 on Saturday, 30 August 2014, Israeli infantry units were present on Kufol Hares and Hares villages’ road. They withdrew later and no arrests were reported. At approximately 00:50 on Sunday, 31 August 2014, Israeli forces were present at the eastern entrance of Deir Ballout village, west of Salfit. They withdrew later and no arrests were reported. · At approximately 12:00 on Thursday, 28 August 2014, Israeli forces arrested Fida’ Mohammed Khader Suleiman (22), from Beit ‘Our al-Tahta village, southwest of Ramallah, near streets (443), which is adjacent to the village. No reasons were revealed behind the arrest. Her family said they learned that Fida’ was taken to Hasharon prison in Israel. · At approximately 11:00 on Saturday, 29 August 2014, Israeli forces stationed on the gates of the Ibrahimi mosque, in the center of the Old City in Hebron, arrested Halah Jaber (19) under the pretext she did not listen to the Israeli soldiers’ orders. She was taken to “Kiryat Arba” settlement, but released later. · On Sunday morning, 31 August 2014, Israeli forces arrested Yousef Ali Breigith (18), from Beit Ommar village, north of Hebron. Yousef was arrested at the entrance of al-Aroub refugee camp and then taken to an unknown destination. · At approximately 16:00, on the same day, Israeli forces deployed behind the annexation wall, west of Ethna village, west of Hebron, arrested Badawi Abu Zalatah (16) and Kazem al-Najjar (17). The 2 children were taken to an unknown destination. · At approximately 13:00 on Tuesday, 02 September 2014, Israeli forces stationed at the entrance of “Gosh Etzion” settlement, south of Bethlehem, arrested Jawad Riyadh Mahmoud Breigith (29) and Mefleh Ra’ed Ahmed ‘Adi (19) while heading to an interview with the Israeli intelligence service upon summonses handed to them previously. · At approximately 19:15 on Monday, 01 September 2014, Israeli forces arrested Hussein Yasser Sultan (28), from Hares village, north of Salfit, and took him to an unknown destination. · At approximately 16:00 on Tuesday, 02 September 2014, Israeli forces arrested Yazeed Mohammed Abdullah Taha (16), from Deir Mesh’el village, northwest of Ramallah, at a checkpoint established at the entrance of “Halmish” settlement, northwest of the city. UNCTAD’s Report on Assistance to the Palestinian People 2014, released Wednesday, has outlined how the economy of the Occupied Palestinian Territory (OPT) lost ground and slowed further in 2013 and 2014 due to the Israeli occupation, resulting in weak growth, a precarious fiscal position, forced dependence on the Israeli economy, mass unemployment, wider and deeper poverty, and greater food insecurity. According to the report, Palestinian women continued to bear the brunt of occupation, condemning them to one of the lowest labor participation rates and the highest unemployment rate in the world. At the same time, devastation caused by recent military operations in Gaza will accelerate ongoing reversal of Palestinian development, the report warned. As noted by UNCTAD, economic growth in OPT, measured by gross domestic product (GDP), declined from an annual average of 11 per cent in 2010 and 2011 to a mere 1.5 per cent in 2013, much below the rate of population growth, resulting in lower income per capita. Unemployment remained extremely high at 36 per cent in Gaza and 22 per cent in the West Bank, and only one in four households was classified as “food secure” or having reliable access to food. Conducted before the outbreak of the Gaza offensive on July 7, the report does not take into account the destructive economic aftermath of the confrontation. “However, even before the latest military operations,” UNCTAD pointed out: “Gaza’s local economy was in a state of total collapse, chiefly because of the accumulated impact of a tightly maintained seven-year blockade and two previous devastating Israeli military operations in November 2012 and December 2008. The consequences will be grave for the Palestinian people and their economy,” UNCTAD economists warn. According to the organization, any lasting recovery of the Palestinian economy in general will be impossible to attain without a sustained effort on the part of the international community to bring about an end to the restrictions on movement in and access to the West Bank, alongside the complete lifting of the blockade, which has been smothering Gaza’s local economy and isolating 1.8 million people from the outside world. “The most recent Israeli military operation in Gaza compounds the dire socioeconomic conditions and accelerates “de-development” in OPT, a process by which development is not merely hindered but reversed by the forces and policies of occupation. In addition to the deaths and mass displacement of thousands of Palestinian civilians, the military operation inflicted massive damage on Gaza’s physical infrastructure,” UNCTAD reported. 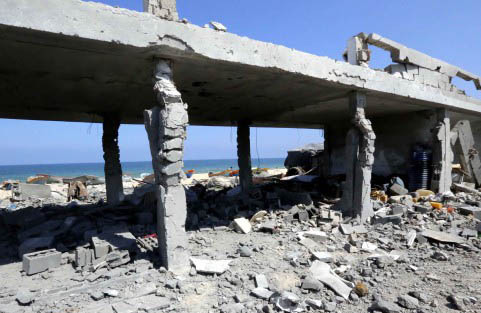 As a number of UNCTAD experts have noted, it is crucial for the international community to base future recovery and reconstruction efforts on the fact that the devastation in Gaza is not just the result of the latest confrontation but is rooted in prolonged occupation, protracted conflict, a sustained, tightly maintained blockade and the recurrent destruction of Gaza’s infrastructure, as has been documented annually in UNCTAD reports on the Palestinian economy since 1985. A special section of UNCTAD’s report focuses on the impact of the continuing occupation of Area C and asserts that the lack of sovereignty over economic and natural resources deprives the Palestinian people of the opportunity to pursue and achieve sustainable economic development. Israel effectively bans all Palestinian construction in 70 per cent of Area C, allowing just 1 per cent for Palestinian development, while restricting construction in the remaining 29 per cent. In violation of its international obligation as the occupying Power, Israeli policies in Area C and the ongoing construction and expansion of illegal settlements have altered the West Bank’s landscape into an archipelago of disconnected islands, the report says. Furthermore, settler violence against Palestinian civilians and property exacts high socioeconomic tolls on the Palestinian people. For instance, in 2013 alone 10,142 productive trees were reported burnt, uprooted or vandalized, the report notes. The UNCTAD report adds that while the displacement of Palestinians continues, the number of settlers in the West Bank, who live in at least 125 settlements and 100 outposts, rose from 800 in 1972 to more than 360,000 in 2012. The report also notes that in the last five years, 2,224 Palestinian structures were demolished including residential structures and schools, while 2,417 Palestinians in Area C were displaced. In 2011 alone 1,000 structures were demolished. In close cooperation with Palestinian counterparts in the public and private sectors, UNCTAD continues to support Palestinian economic development endeavors by carrying out policy-oriented research, implementing technical cooperation projects and providing advisory services. The United Nations Office for the Coordination of Humanitarian Affairs (OCHA) and the United Nations High Commissioner for Human Rights (UNHCHR) called on Israel to ensure respect for international law by avoiding punishing individuals for offences they have not personally committed or by imposing collective penalties. In its weekly report issued on Friday, OCHA said that the large-scale Israeli military operations, which began on 13 June in the Hebron governorate following the suspected abduction of three Israeli youth, continued and expanded across the West Bank, with the stated objective of finding and releasing the youth, as well as undermining Hamas infrastructure. The report also pointed out that movement restrictions continue disrupting access to services and places of work. "Most of the movement restrictions imposed last week following the start of the current operations, primarily across the Hebron governorate, have remained in place, disrupting access of people to services, markets and workplaces, and resulting in significant economic losses." The vast majority of Hebron governorate’s residents have remained subject to a series of additional movement restrictions, including preventing men aged between 16 and 50 from crossing the Wadi an Nar checkpoint, which controls the single route available for most Palestinians between the central and southern West Bank, the invalidation of permits to access East Jerusalem, Israel and some settlement areas, and preventing men between 20 and 50 years of age from traveling to Jordan via the Allenby Bridge, the report clarified. ]In the northern West Bank, the main entrances to ‘Izbet at Tabib and ‘Azzun villages (Qalqiliya) have remained closed for the second consecutive week, forcing residents to use a long detour to reach main services and workplaces in Qalqiliya city and increasing transport costs. On 17 and 18 June, the Israeli authorities demolished a total of 14 Palestinian-owned structures in Area C of the West Bank, due to the lack of Israeli-issued building permits, displacing 42 people, around half of whom were children, and affecting at least 50 others.